I also realized back then, how enjoyable healthy plant foods really tasted. As a kid, I always enjoyed the veggies and fruit but didn't get enough of them. Too much of my food was coming from meat and processed foods. As an adult, especially after college, I overdid the processed foods. I cringe every time I think about how bad I ate back then. It's no wonder my blood pressure was high. It's a miracle that I avoided diabetes, but then again, who knows... I might have had it back then and didn't know it. All I know is that I'm no longer hypertensive and my blood sugar is normal. You can't exercise a bad diet away. I went to the gym like 3 or 4 times a week when I was heavy. I was getting no where. I stopped weighing myself. I did not want to see my weight after 350 pounds. This way, I could deny it and think to myself that I wasn't as heavy as I was. But the physical I finally had 6 years ago (after avoiding the doctor for so long), was a wake up call. I did not want to rely on meds for the rest of my life. The thought of meds pushed me to look at the food I was eating. I researched online everything about blood pressure, and what foods to eat to get it down. Along the way, I read Dr. Fuhrman's book "The End of Diabetes". I credit Dr. Fuhrman as the first doctor to really open my eyes. I still follow his dietary guidelines of eating the "GBOMBS" (green, beans, onions, mushrooms, berries and seeds) and I do eat them every day. Ever since I started my weightless journey, it has always been about health. I kept hearing how bad meat was. I gave up red meat first, back in 2013. I had a lot of confusion over protein, as my personal trainer at the time wanted me to have 200 grams per day (can you imagine?). This was the main reason it took me so long to switch to a complete plant based diet. I wanted to keep healthy, plus I had loose skin that I wanted to tighten. I kept reading about the benefits of a whole food plant based diet. I know others say that eating as clean as possible will help some of my skin tighten. And I stumbled upon Robert Cheese and other vegan bodybuilders. Something clicked... "hey, I don't need all that excess protein to build muscle"! I've been plant based ever since then and have no regrets about it. 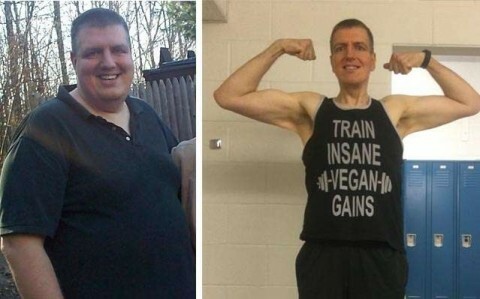 I only wish I started the plant based journey when I initially lost the weight. I bet I would have less flabby skin on my abs now if I did. But the important thing is I feel great. I also don't need to weigh myself everyday as I have what I eat down to a science. The veggies and fruit keep my weight down and I eat a lot. I also have lots of energy, working out 5 days a week. I never, ever would have imagined I would have kept it off, as I said earlier, but I am so glad I did. It's a lifestyle change, and I choose health over candy and ice-cream any day!